In medium bowl, crumble cookie dough. Stir or knead in cream cheese, flour and 1/2 teaspoon of the vanilla until well blended. 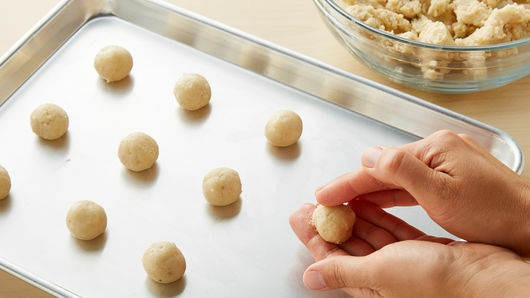 Shape dough into 44 (1 1/4-inch) balls. Place 1 inch apart on large ungreased cookie sheets. Bake 11 to 13 minutes or until edges are set. Cool 1 minute on cookie sheets. Remove from cookie sheets to cooling rack. Cool completely, about 30 minutes. In small bowl, stir powdered sugar, remaining 1/4 teaspoon vanilla and 3 tablespoons water until smooth. Add more water, 1/4 teaspoon at a time, as needed for desired dipping consistency. Dip top of each cookie into glaze. Sprinkle with decors. Store in airtight container in refrigerator. Replace vanilla with anise extract for a more Italian flavor. Make cookies ahead. Shape dough into balls, then cover and place in freezer. When ready to bake, just bring them out. Bake the whole batch, or just a few at a time. 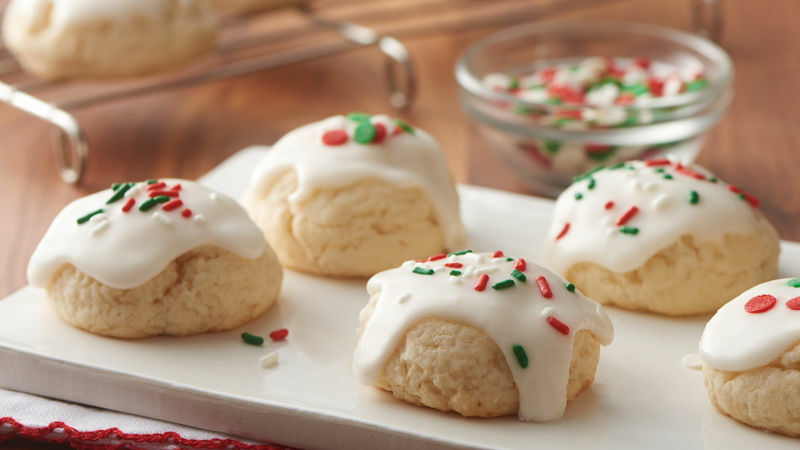 Our Pillsbury spin on classic Italian Christmas cookies is the quick and easy way to feed a crowd this season, thanks to its impressive yield of 44 servings. 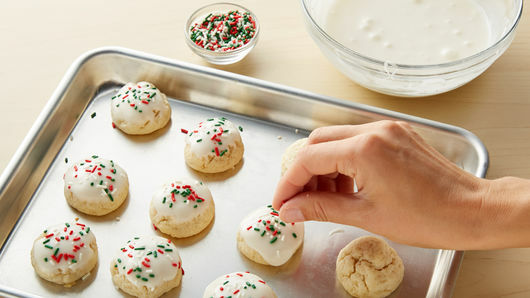 By using Pillsbury sugar cookie dough as its base, these cookies allow you to skip past fussy prep, giving you back more time with your family during the busy holiday season. Pro tip: If you’re craving more of an authentic Italian flavor, you can substitute vanilla with anise extract. Anise’s flavor is similar to licorice in taste and is often called for in baking Italian or German dishes. Craving more Italian-inspired treats? From maple-nut biscotti to easy chocolate biscotti, there’s an Italian cookie recipe with your name on it. Need a cookie baking refresher? We’ll walk you through the cookie baking process in our how-to guide. As an added bonus, we’ll tell you the best cookies to mail and freeze so you can keep this cookie party going all season long!